It’s clear that smartphones are the phones of the future and even the present with huge and growing presence in developed markets, and as they evolve we’ll only start carrying more screens with us. One easy way to do so is to wear such devices and yesterday the New York Times said that over the past year Apple and Google have started secretly working on wearable gadget projects. For Apple it’s a way to further boost its sales and for Google it’s another way to sell ads. The report says that in Google’s secret X labs researchers and engineers hired from universities and companies like Nokia and even Apple are working on wearable computers. 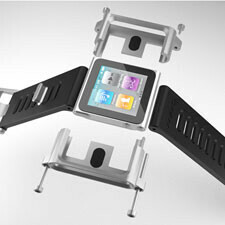 Apple has also tested some conceptual products and prototypes, but even now the company is encouraging customers to wear the iPod Nano as a watch. Most interestingly, though, a “very small group of Apple employees” had been working on concepts and prototypes of Apple-branded wearable gadgets. One of the idea that might end up on shelves is a curved-glass iPod wrapping around your wrist with voice user interaction helped by Siri. The smartphones is the processing brain, the single hub which will drive those devices. Going into the sci-fi of future, engineers and physicists have long ago predicted that we’ll be wearing glasses with screens and even contact lenses with displays, and all of that now seems closer to reality. What’s your image of the gadget of the future, how would it look like? That would be awesome. iOS with Siri would be a great OS to have on a watch. If they can make it waterproof, it is a winner. you are right! And apple is the only company right now who could popularize something like that. the motoactiv from Motorola is really nice but needs mass adoption, and Motorola cant do that. We're gonna have Augmented Reality Glasses in the fear future. And a super power PS4/Xbox 3 in 2013 E3 Expo. I hope samsung or htc will come out with a smart watch, not like moto for fitness, but just for time, bluetooth to cell for number and picture, and text notification with quick text back. There have been companies that have made stuff like it but either they aren't good or they cost way too much.